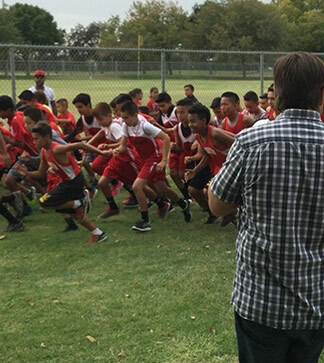 The athletics program at John Muir Middle School is a great medium for student development physically, emotionally, and socially. We encourage all students to take part in a sport that will not only improve their overall health but will teach them vital social skills that will translate into success in everyday life. We not only encourage student participation in our athletics program, but we consider it a privilege. For this reason, our staff assesses each student’s report card and determines which students are eligible for participation. A grade point average (GPA) of 2.0 or higher qualifies a student for sports participation. Athletics participants must also have a “C” or better in P.E. in order to participate in sports. Students entering the sixth grade are eligible and may remain eligible depending on the first quarter grade report. Students going into seventh and ninth grade are eligible through their previous year’s final grade. Once we deem students eligible to participate, they must complete an approved waiver form or a physical examination. Good behavior is vital to all athletics programs. Students and parents must sign an athletics, academics, and behavioral contract before participating. On game and try out days, students must attend school the entire day in order to participate (a doctor’s note or an administrative decision regarding a valid excuse is the only way to clear this restriction). If a student is put on detention, the detention takes precedence over games and practices. Students who attend their detention are deemed eligible to play, if time permits, if transportation is available, and if the coach is in agreement. Suspension of a student athlete, for any reason, will render that student ineligible or removed from the team for one week per every day of suspension. For example, if a student athlete is suspended for two days, he/she may not participate in games or travel with the team for two weeks. We leave the participation of training and practices at the discretion of the coach. During their suspension period, student athletes may not participate or attend any school sporting event anywhere or at any time. Coaches may also remove students from a sport at any time. The coach decides the play time and position of the students, and it is his/her decision to deem a student eligible or not. The athletics director is available to schedule events, enforce safety, provide equipment, and ensure that all student athletes and coaches adhere to all rules.